DURHAM, North Carolina (WTVD) -- A warm breakfast and presents to unwrap - it's a tradition many would miss this Christmas if it weren't for the Durham Rescue Mission. This year, one gift in particular will help change lives for countless Christmases to come. "To God be the glory!" said CT Tomlin, shaking hands with Ernie Mills while handing the founder of the Durham Rescue Mission a check from the Tomlin family worth $10,000. "I don't own it," said Tomlin of the money he's donating. "I'm just a steward for the Lord and He's told me to do this." For years, the Tomlins have given back to the Mission, handing out gift cards or Bibles with $100 bills tucked inside to the men, women, and children living in the shelters. This year's gift, matched by Square One Bank for a total of $20,000, is helping to launch a new program, Homes for the Homeless. 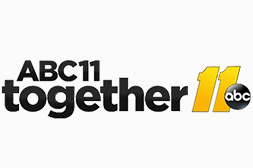 Gail Mills, Mission co-founder, tells ABC11 men and women living in the shelters who graduate from the Mission's Victory Program, have taken Dave Ramsey's money management course, and been approved through Habitat for Humanity, will be able to use money from the Homes for the Homeless fund to help cover their closing costs on a new house. "There's a scripture verse in Matthew 25 verse 40 which says, when you help the least of these, you've helped me," said Tomlin. "So in a way, I'm putting a home for Jesus." The generous donation and big announcement came on Christmas Eve as the Mission hosted its annual Christmas brunch. Gifts that shoppers at area malls donated are rolled in and placed under the Christmas tree while residents enjoy a warm meal of eggs and pancakes. "It's just a good feeling to have family," said Linda McNeil, who moved into the women's shelter last year. "A lot of us don't have family that's gonna visit us." Over at the men's shelter, Gail calls out names while Ernie and others help pass out gifts, bringing a smile to all their faces. "It's these men here that sometimes feel like nobody loves them," said Ernie. "And this is our time to tell them yes, people of Durham do love you and care for you. And that warms my heart."